A hymn, beginning thus, in the home-ritual for Passover eve, and one of the latest constituents of the Seder Haggadah, dating from the fifteenth century (see Haggadah). It was originally intended for the first night of the Passover only, and Addir Hu was selected as its pendant for the second night; but, as shown in connection with that hymn (see Jew. Encyc. i. 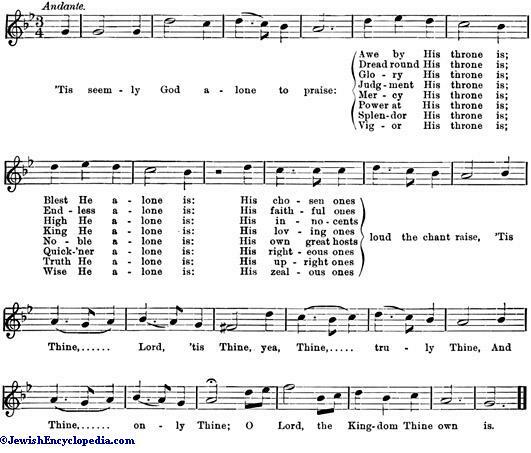 186), for more than two centuries both hymns have been used together on each occasion. Somewhat similarly to "Addir Hu," "Ki lo Na'eh" is constructed in eight stanzas, identical save for the three varying words which successively bear as their initials the twenty-two (or, with the last thrice utilized, twenty-four) letters of the Hebrew alphabet. 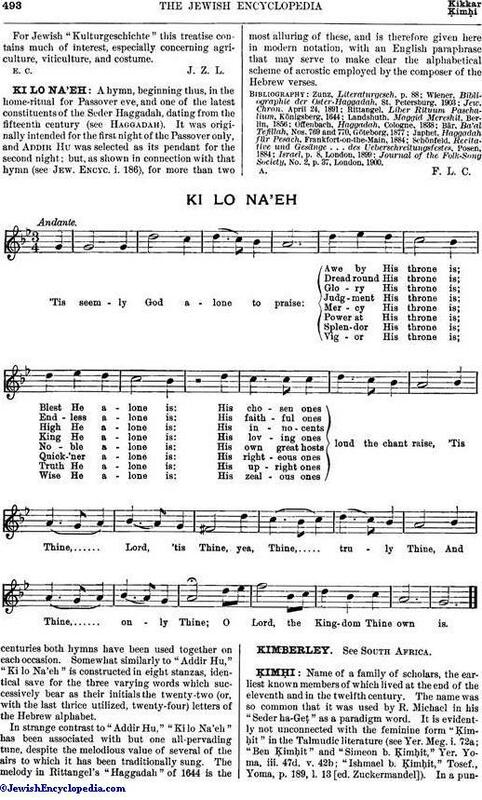 In strange contrast to "Addir Hu," "Ki lo Na'eh" has been associated with but one all-pervading tune, despite the melodious value of several of the airs to which it has been traditionally sung. The melody in Rittangel's "Haggadah" of 1644 is the most alluring of these, and is therefore given here in modern notation, with an English paraphrase that may serve to make clear the alphabetical scheme of acrostic employed by the composer of the Hebrew verses. Journal of the Folk-Song Society, No. 2, p. 37, London, 1900.